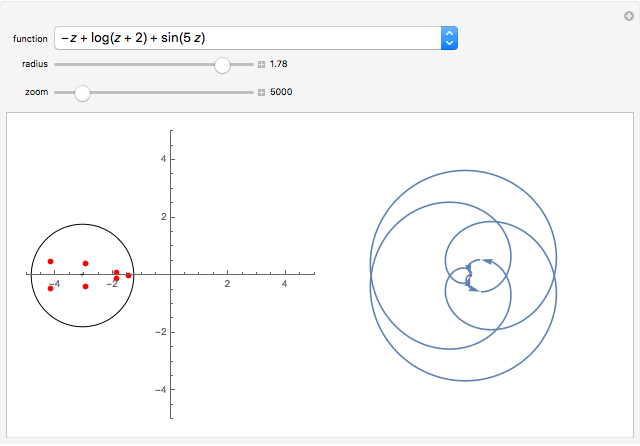 For a given analytic function chosen from the popup menu, a circle radius chosen using a slider, and a circle center denoted by "+" (which can be dragged), the graphic on the left shows the roots of inside the disk of radius . 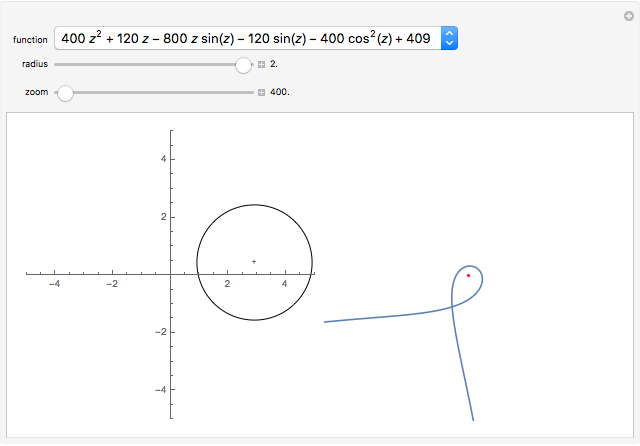 The graphic on the right shows the image of the circle under the map and the origin of the coordinate system. According to the argument principle, the number of roots of (counted with multiplicities) inside the disk is equal to the winding number of the image of the circle around the origin. When the circle is dragged, its image under can become very large or very small. A zoom control is provided that can be used to see the entire closed curve or, alternatively, the behavior of the curve near the origin (the little red point in the graphic on the right). Zooming in and out may be necessary to correctly count the winding number. The argument principle is usually stated in integral form: for a function that is continuous on a simple curve and analytic inside , the number of zeros of inside is given by the path integral . By making the substitution , we see that the number of roots inside is , where denotes the image of the curve under . This is the winding number of the curve with respect to the origin. This fact can be used to find the number of roots of analytic functions in bounded regions, a key step in finding the roots themselves . Recall from  that the winding number of an oriented closed curve around the origin can be computed as follows. If the origin lies on the outside of the closed curve, the winding number is 0. Otherwise, one draws a line from the origin to any point lying outside the curve and counts the number of intersection points (including multiplicities). Intersections where the curve is moving leftward are counted with a plus sign and the ones where the curve is moving rightward with a minus sign. 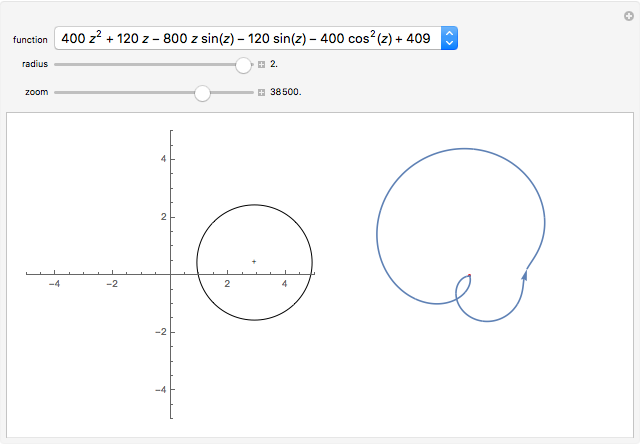 By computing the winding number visually using the picture on the right-hand side one can check that it agrees with the number of roots enclosed by the curve on the left. Sometimes to compute the winding number visually one needs to zoom in and out. This is illustrated in snapshots 2 and 3. In this case there are no roots enclosed by the curve, so the winding number is 0. Looking only at snapshot 2 we could think that the winding number is one, however zooming in on the origin in snapshot 3 shows that it is indeed 0. P. Kravanja and M. Barel, Computing the Zeros of Analytic Functions, New York: Springer, 2000. T. Needham, Visual Complex Analysis, Oxford: Oxford University Press, 1998. Andrzej Kozlowski "Counting the Number of Roots of Transcendental Functions in Bounded Regions Using Winding Numbers"